Along with much of the rest of the population, these cookies are a family favorite. Sometimes we call them Mexican Wedding Cake Cookies, but in my little, homemade cookie recipe book that I made in Brownies from 1963, they are called Snowballs. 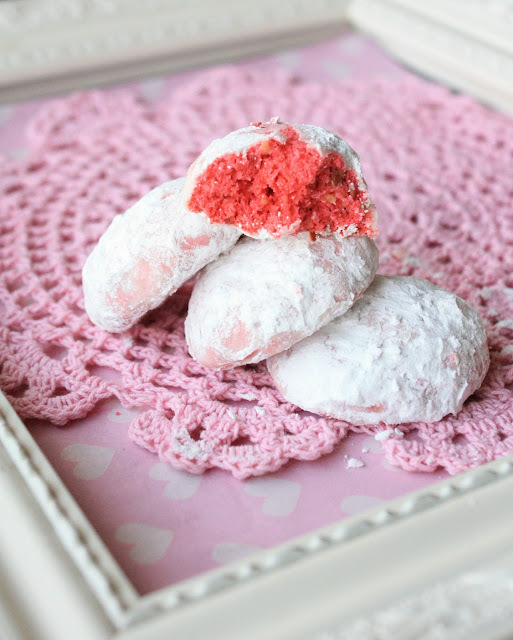 Snowballs is a nice fit for a January cookie, and I made them pink/red, which allows them to do double-duty as a Valentine's Day cookie also. I actually made these cookies last January (in fact I noticed that I uploaded them to my computer exactly one year ago today! ), but never posted them. I think they look so pretty with the contrasting white of the powdered sugar. The reason these cookies are so popular is because they are pretty easy to throw together and they are so delicious; they melt in your mouth! For variation it's easy to add alternate nuts other than walnuts, and to roast them first, for more flavor. Cream butter together with the sugar and add vanilla. Mix well. Add the flour and the ground, roasted* nuts. Add the food coloring and mix thoroughly. Shape into balls and bake at 375 degrees until lightly browned (My oven took about 15 min.). Cool and roll in powdered sugar. *to roast nuts, place in a single layer on a baking sheet and place in the oven at 350 degrees for about 10 minutes. Grind after they are cooled. What a fun twist on the traditional!! So, so, so pretty! I'm definitely going to have to make these for my girlies! 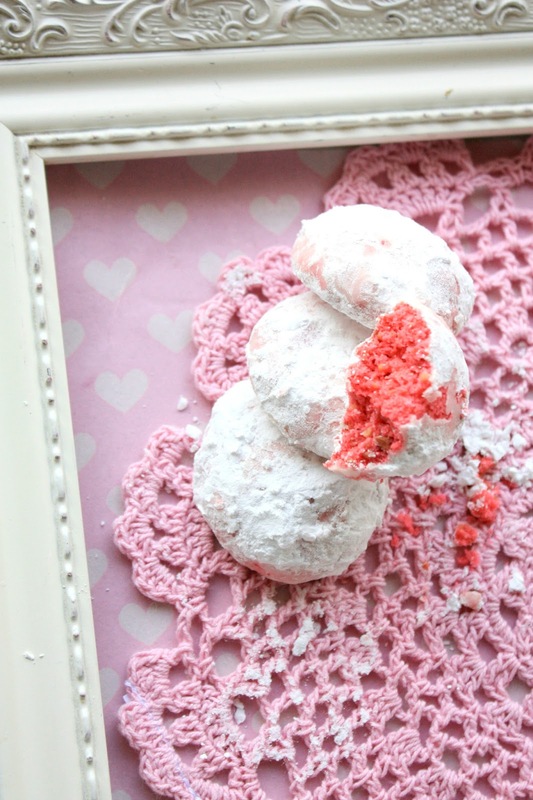 the cookies look great, but i LOVE the pink Doily underneath! Happy New Year, Sue! I love that you're getting on Valentine's Day now since it isn't too far off. I can't wait to see all the Valentine creations you come up with this month! 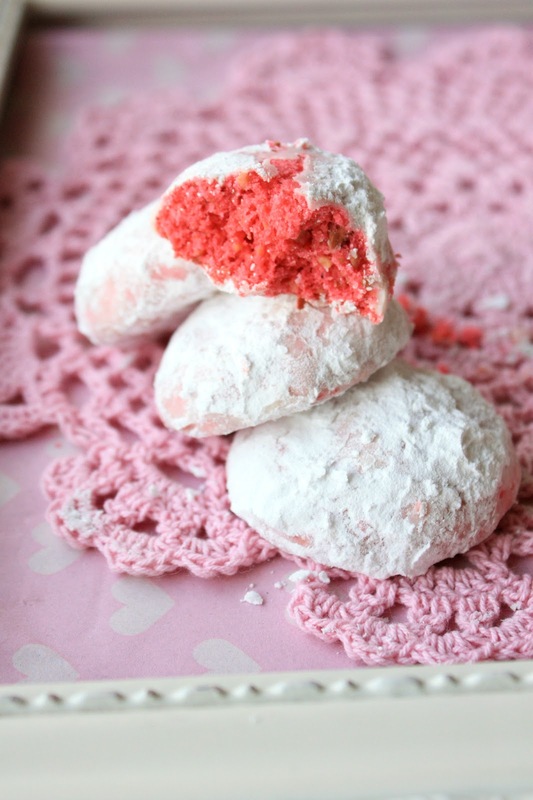 Love these snowball cookies so much..the red against the powdery white cookie is a stunning surprise! Best cookies ever!!! Love that you made them red for Valentine's Day. So clever. I'm going to have to do this because I seriously could eat these cookies every single day! Thanks, Sue! Happy New Year! Can't wait to see what amazing creations you bring us this year! These V-day cookies are totally amazing! These are so cute! And you've photographed them beautifully with the pretty pink background :) a very sweet idea for Valentine's day too! I want a Mexican wedding if it means that I'll have these pretty things everywhere! I'm not really big on Valentine's day, but I love Valentine baked goods! Haha! Hello! Love your blog ! Everything looks SO yummy. I nominated you for the Super Sweet Blog Award located here: http://muffinsandmocha.wordpress.com/2013/01/08/nominated-for-super-sweet-blog-award/ Please check it out. Look forward to trying more of your recipes! I am hungry!! Those look delicious! I can see why these would be Mexican wedding cookies, they're so pretty and I love that you put them in a frame to take the photos too. I know I already commented but had to stop by again and say you've been featured on Sugar & Slice Sunday link party.